By July 1600, suddenly everyone in Rome knew about a young artist from Milan, even though he’d already been in the Eternal City for about seven years. Up to this point, however, he had only painted for an elite clientele. By September of that year, he was being called “the city’s most famous painter.” Now Michelangelo Merisi’s name was on everyone’s lips. That name was simply “Caravaggio.” His two large-scale paintings of events in the life of St. Matthew–Christ calling him away from his work as a tax collector and the other of his martyrdom at the hands of a soldier—had just debuted on the walls of the Contarelli Chapel in San Luigi dei Francesi. These two very public paintings changed all the rules—the artist was decidedly not a conformist—and altered the course of the history of art with their dramatic, focused images of very real, everyday people emerging out of deep shadow, defined by shafts of brilliant light. Caravaggio’s reputation—like the man—burned bright for several decades and then suddenly went out. It wasn’t until 1951 with a landmark exhibition in Milan organized by the great Italian scholar Roberto Longhi did the artist reclaim his hold on the popular imagination. He hasn’t let go since, his work spawning a cottage industry of exhibitions and books, and even films. So it is unsurprising that the Caravaggio anniversary year of 2010—the 400th anniversary of the artist’s tragic and untimely death—launched another spate of exhibitions in Europe and the United States, the most important of which was held at the Scuderie del Quirinale in Rome, and a little later, companion exhibitions at the Musée des Augustins, Toulouse, and the Musée Fabre in Montpellier. These two combined exhibitions are now touring the United States, currently at co- organizer Los Angeles County Museum of Art (on view until the 10th February 2013) and then travelling, much reduced, to the Wadsworth Atheneum in Hartford, CT, under the auspices of FRAME (the commendable French Regional American Museum Exchange). 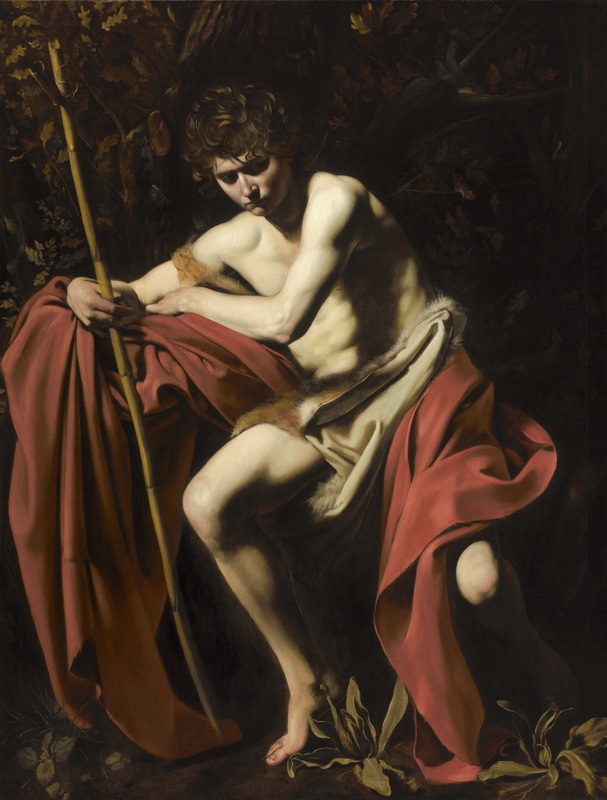 Bodies and Shadows: Caravaggio and his Legacy is a first for LACMA, Los Angeles and California, the very first time that paintings by Caravaggio have been exhibited here. It follows another North American exhibition last year, Caravaggio: His Followers in Rome organized by the National Gallery of Canada, Ottawa, and the Kimbell Art Museum, Ft. Worth, both similar in concept, but different in content. The latter show is the natural comparison to the present effort; they shared both aims and loans as well as had their differences (notably the Ottawa-Ft. Worth show was accompanied by a more substantive catalogue and the LACMA-Hartford show had, by definition, loans mainly from France and the U.S.; the optimal experience was to have seen both). LACMA’s exhibition and catalogue eschews the term “follower,” which was front and center in the earlier U.S. show. Regardless of the semantics, the“followers” were delineated more carefully in the Ottawa-Ft. Worth exhibition. Often simply referred to as “Caravaggio,” in his own lifetime as since (after his family’s hometown east of Milan), the artist was responsible for groundbreaking paintings which were produced in a few compressed years (about fifteen). In that short span he managed to traverse an arc that it took a Rembrandt or a Turner a half century to accomplish, ending life having attained the absolute pictorial “essential.” His development began as an innovative, yet unripe painter of genre subjects (music makers, card players and fortune tellers) to a fully mature image maker—still iconoclastic, but painting with supreme confidence for some of the most important patrons and religious establishments of Rome—to finally a man on the run, creating dark, summarily painted pictures wherever he wound up. Caravaggio’s particular viewpoint, which we commonly refer to as “realist” (or sometimes “naturalistic,” which is not quite right as that was really the province of his chief competitor Annibale Carracci), was really anything but. It was a highly artificially staged theatricality—often a dark, airless room with the single raking light source from a window—which picked out of the gloom the features of the figure or figures posed therein. These figures were recognizably people from the streets, posed as the Virgin Mary or an apostle, which naturally scandalized the authorities but evidentally mesmerized the populace. I generalize of course, but it was this intense focus on the subject, an emotional approach, that seemed directly to connect the viewer to the picture. Often times unsettlingly so, for his religious commissions were often as not rejected for their lack of “decorum,” too many exposed legs, dirty feet and recognizably common faces in his renditions of holy folk. Even so, the uncompromising severity of his narrative, in addition to his emotive subjects, fit well within the tenor of the times, the height of the Counter-Reformation, when the Roman Catholic Church sought greater means of communicating more meaningfully and simply with the faithful. The beginning of the end came on the 28th May 1606, when the artist killed one Ranuccio Tomassoni at a tennis match. 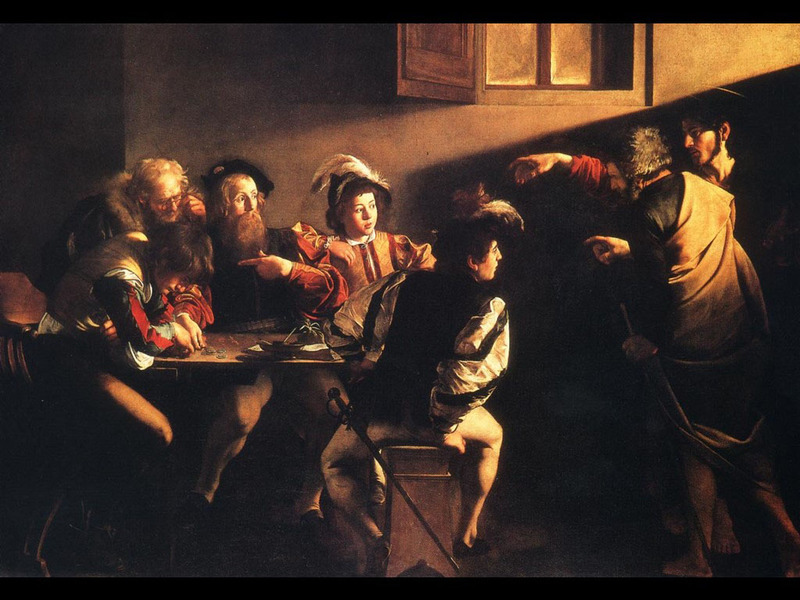 Foreshadowing this ultimate transgression, much of what we know of Caravaggio’s life in Rome previous to this is based on legal documentation: notices, complaints, arrests, and depositions. The rest of the painter’s grueling life was spent on the lam, to Naples, Malta and Sicily. Nevertheless, in spite of—or perhaps because of—this he continued to churn out dark, introspective yet sublime masterpieces until his mysterious death at the age of 38 on the Tuscan coast, where he lay stranded and ill trying to get back to Rome and a papal pardon. Since there are only around sixty accepted works by him that survive or are known today—and due to his modern reputation as a tortured bisexual genius, there is a huge impetus to identify, to rediscover, new works by him. Fortunately (or not), there are many candidates given the impact Caravaggio’s innovative work had on his contemporaries and those after, all of whom produced scores of copies and Caravaggesque paintings. From time to time these “rediscovered” paintings crop up; very occasionally they are autograph (such as in 1987 when the Kimbell Art Museum announced their acquisition of the long lost early and influential Cardsharps or in 1990 the Taking of Christ, a Roman masterpiece of 1602-3, National Gallery of Ireland). The issue of authenticity is the thorniest in Caravaggio studies, and entire exhibitions have been predicated on new discoveries or the inclusion of recent attributions to Caravaggio’s oeuvre. The Ottawa-Ft. Worth and Los Angeles-Hartford exhibitions are no exceptions. Both included paintings that are attributed to the master but that are clearly not by him (the Fondazione Longhi Boy Bitten by a Lizard in the former show springs to mind). Straight out of the gate in the LACMA exhibition is a controversial picture, the Portrait of Maffeo Barberini, c. 1596-97 from a Florentine private collection (reproduced on the left). It is the first time this painting has been seen in the United States. Depicting the future pope and major patron of Bernini, I was initially enthusiastic as a passage or two, such as the modeling of the prelate’s left hand gripping the chair arm seemed analogous to the early Ft. Worth Cardsharps. But after sustained looking, and despite as the catalogue tells us that recent conservation on the painting revealed its quality and “ ‘drawing’ with a dry point” (something a follower could have emulated), the visual evidence suggests the contrary. For example, the still life of the vase is charming, but doesn’t compare to the still life elements in the earlier Borghese Boy with Basket of Fruit (c. 1593-4) or more to the point, the vase on the marble table top in the Hermitage Lute Player of c. 1595-6. The existence of another Lute Player, on long-term loan to the Metropolitan Museum of Art from a private collection, may point to the artistic identity of the painter of the Barberini portrait. Although published as a re-discovered Caravaggio in 1990, connected to an entry in the 1627 inventory of the collection of Caravaggio’s first patron Cardinal Francesco del Monte, the execution doesn’t bear up. 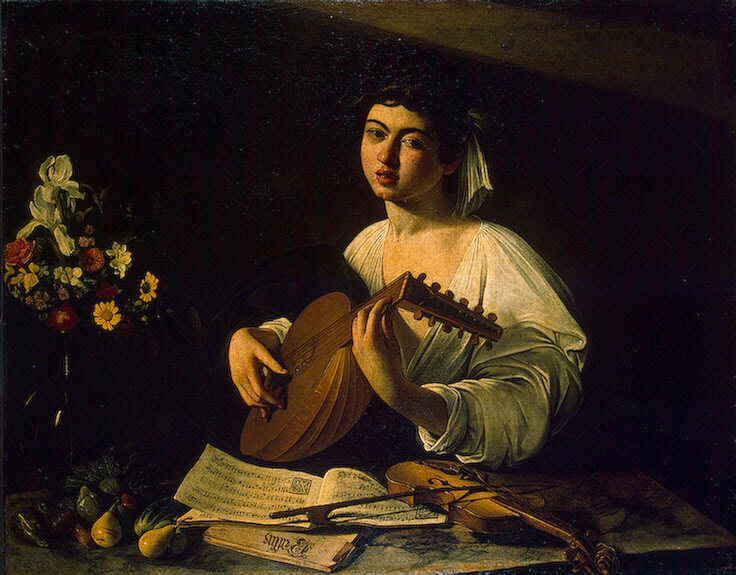 However, notice the similarity of the treatment of the eyes in the New York Lute Player and the Barberini portrait in L.A.: Caravaggio’s treatment of almond-shaped eyes but painted with a certain hardness, as well as the highly modeled nose in both faces. They also share the same rubbery, “worm-like” fingers. There were quite clearly very talented followers (as well as copyists), such as are exhibited in the present exhibition. We know from documents that artists were making copies of Caravaggio’s paintings as early as the last years of the 16th century, and that Cardinal del Monte and many other collectors owned not only Caravaggio originals, but copies of his popular compositions. I would suggest that this portrait of Maffeo Barberini and the Lute Player in New York belong to the latter category, and who knows, may have been painted by the same artist. At least they share some stylistic traits. Finally, the existence of another apparently contemporaneous but far more accomplished portrait of Maffeo Barberini, also in a private collection (above right), provides a far more convincing example which is stylistically aligned with Caravaggio’s works of the turn of the century. The Tooth Puller, c. 1608-10. The authorship of two other paintings in the present exhibition has also been questioned. The Ecce Homo from Genoa, which despite its strong visual interest, has little in common stylistically with accepted works by Caravaggio. The other is the extraordinary Toothpuller (c. 1608-09) from Palazzo Pitti, Florence. Although listed as by Caravaggio when first recorded in the Medici collections as early as 1637, only recently has it been strongly argued that it is by Caravaggio himself. I think that in this case the canvas’ sheer power—the crude but mesmerizing violence—makes a good case for the master’s authorship. The painting’s condition is compromised, which makes it difficult to arrive at a conclusive decision (it may account for the awkward appearing patient’s hand gripping the chair). But the emphatic gesture of his opposite hand splayed in pain, the brushstrokes in key areas of flesh, and the old crone to the right have direct comparisons in Caravaggio’s works, even within this exhibition, such as the old woman in the riveting, late Salome (c. 1609-10) from the National Gallery, London, or the brushwork in the sad, sublime Denial of St. Peter (1610; Metropolitan Museum of Art). 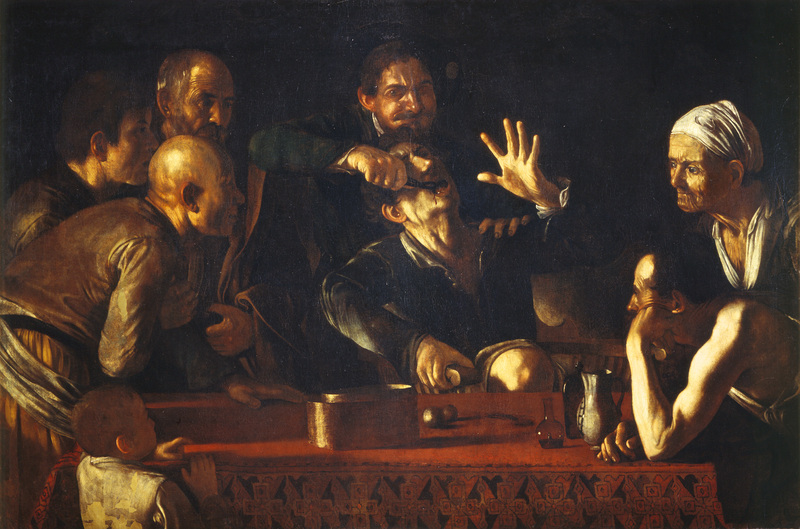 In any event, it is clear that the composition’s disturbing combination of crude humor and cruelty exerted a hold on the imagination of other artists as demonstrated opposite the Pitti Palace Caravaggio by a rendition from the studio of Flemish painter Theodoor Rombouts (The Toothpuller, c. 1625-30; Musée d’art Roger Quilliot, Clermand-Ferrand). 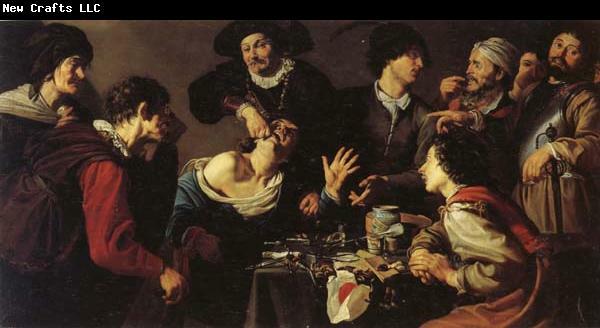 Rombouts knew the Caravaggio painting from his sojourn in Florence in the early 1620s. Comically gauche, this interpretation of its far more sinister predecessor boasts a marvelous still life in the mélange of dental instruments, teeth and other items spread out on the table. 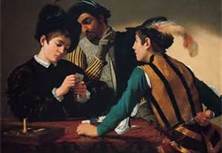 The next Caravaggio paintings after the Barberini portrait introduce us to his religious subjects (the artist generally departs from genre painting and the fortune tellers, boy musicians and cardsharps that proved so influential, especially to the Northern Caravaggisti, after the 1590s). The St. Francis in Ecstasy (c. 1596; Wadsworth Atheneum, Hartford) was the first painting by the artist to be acquired in the United States (in the 1940s); it remains one of the most beautiful, showing Francis reclining, overcome by rapture, supported by an angel. The horizontal composition—with a rare, nocturnal landscape by Caravaggio—and the boyishly handsome face of the angel point backwards to his earlier works of cardsharps and young cavalieri, while its spirituality points forward to his religious masterpieces painted in Rome, Naples and Sicily. 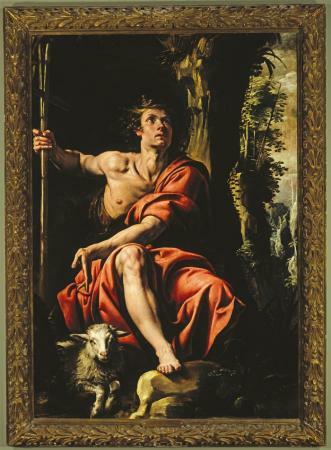 Immediately adjacent is the large-scale, single-figure altarpiece, St. John the Baptist (c. 1603-05; Nelson-Atkins Museum of Art, Kansas City) commissioned by the Genoese banker Ottavio Costa for a family chapel in Liguria. But Costa kept it for his collection in Rome, substituting a copy back home. No wonder, as it is one of Caravaggio’s most powerful, mysterious and beautifully rendered figures. It is arguably the artist’s greatest work in the Western Hemisphere. 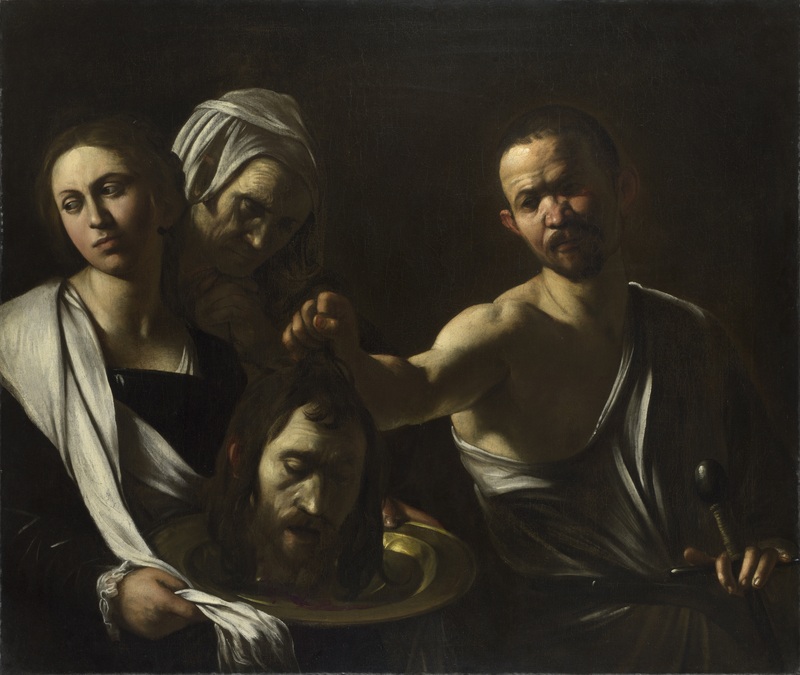 Interestingly, the Ottawa-Ft. Worth exhibition didn’t neglect the comparison between the Caravaggio and Tanzio, exhibiting the two paintings of the Baptist next to each other in Ft. Worth last year. So it is surprising, then, that in the present exhibition LACMA didn’t include its own, very rare altarpiece by Tanzio. 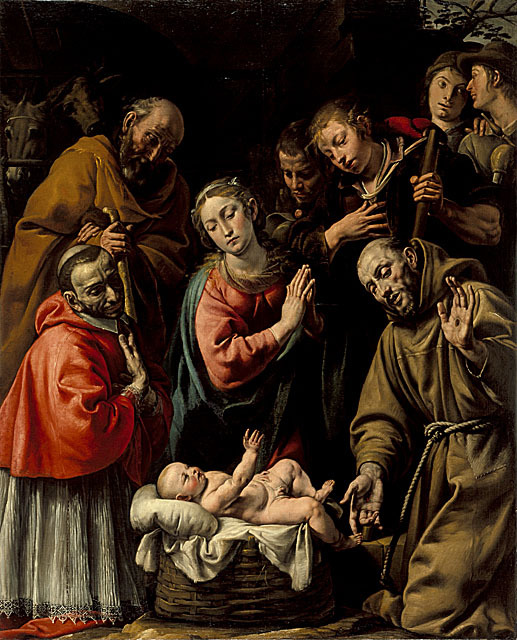 The museum’s Adoration of the Shepherds with Saints Francis and Carlo Borromeo (c. 1628) is a splendid example of Tanzio’s combination of Caravaggio’s tenebrism and Lombard Gothic-Renaissance heritage. Regardless, Bodies and Shadows gathers together some excellent works by those whom we understand were close to Caravaggio. The Italian scholar Gianni Papi, in his fascinating but idiosyncratic overview of the Caravaggisti in the LACMA catalogue, concentrates on four of the followers, taking his cue from Giulio Mancini, an early 17th-century source for information on Caravaggio: Bartolommeo Manfredi, Jusepe de Ribera, Cecco del Caravaggio and Spadarino. Mancini also includes Carlo Saraceni, who is seen to great effect here with LACMA’s elegant Martyrdom of St. Cecilia of c. 1610, painted only about ten years after the saint’s body was disinterred and her tomb restored in Rome. While Papi makes a great point of Cecco—who may have been the assistant Francesco documented living with Caravaggio at one point—there are no paintings to represent him here and neither, for that matter, is Spadarino. Two artists who also knew Caravaggio rather well and proved closer to him stylistically for a time, although he had his issues with them both—Orazio Gentileschi and Giovanni Baglione—are both represented with magnificent pictures, such as Baglione’s St. Francis in Ecstasy, c. 1601 (a typically brilliant acquisition by LACMA curator and exhibition co-organizer Patrice Marandel). Baglione is best known for writing the first account of Caravaggio’s life, and while Baglione was an early proponent of Caravaggio’s style, eventually sued Caravaggio for libel. 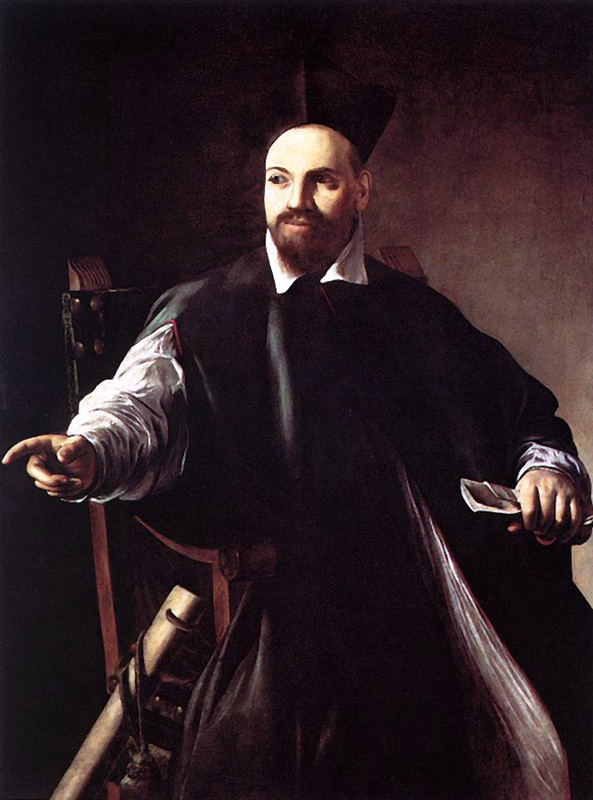 As for Ribera, although Papi and some others believe Ribera personally knew Caravaggio in Rome, we still have no evidence of this young Spaniard there until 1612. 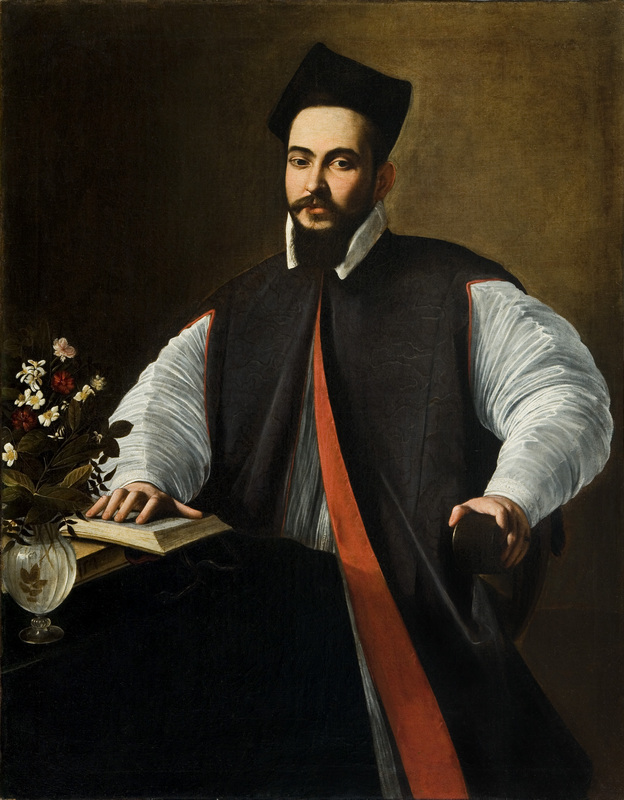 Both Bartolomeo Manfredi and Ribera, who later left Rome for Naples for the rest of his life, are each represented by several examples. Manfredi was highly influential in translating Caravaggio’s new compositional format of half- and three-quarter length figures arranged across a shallow, horizontal field (for heightened dramatic effect, bringing the action into the viewer’s immediate space) to other artists. In fact, the format was named for Manfredi, such was his role in popularizing it, the manfrediana methodus. One such example is the impressive Christ Expelling the Merchants from the Temple (c. 1616-17; Musée des Beaux-Arts, Libourne). While somewhat damaged, is a symphony of contorted figures and faces registering great emotion, straight out of the Contarelli Chapel. This last—Caravaggio’s first public commission—was highly influential, with a number of variants by others seen here, such as Nicholas Tournier (High Museum, Atlanta); the compositionally verbatim, but stylistical disparate Niccolò Tornioli Calling of St. Matthew, and the chromatic fantasy of the ravishing signed and dated Claude Vignon Martyrdom of St. Matthew (1617; Musée des Beaux-Arts, Arras). 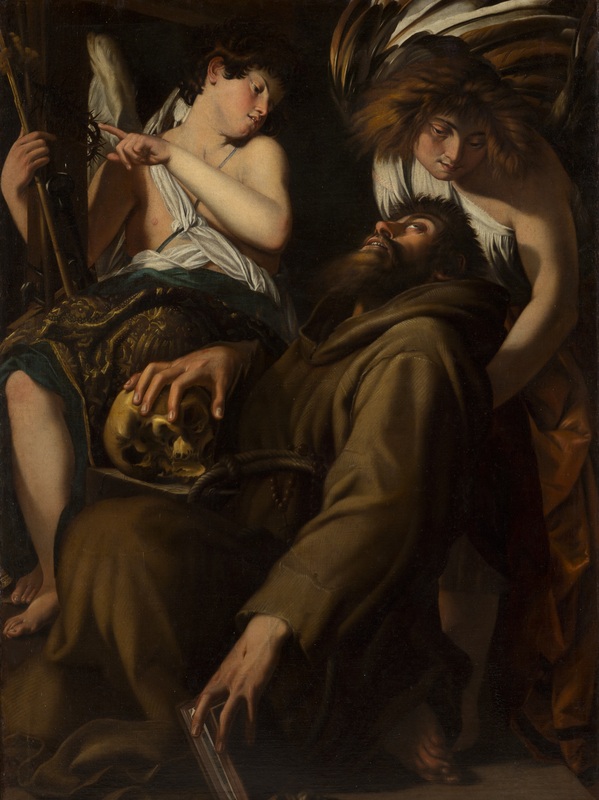 The manfrediana methodus format’s popularity can be in seen in countless religious and genre pictures throughout the exhibition, especially in examples from Dutch and Flemish artists who also flocked to Rome and took up Caravaggio’s cause. Especially notable, for example, is yet another fine Marandel acquisition for LACMA, the Dutch Gerrit van Honthorst’s Christ Crowned with Thorns, c. 1617, where out of the deepest shadow, lit by candlelight, the tortured Christ appears. So close we are to the action, it is as if we are standing alongside his tormentors. There are excellent groups of Spanish and French pictures. Whether Ribera was in Rome early enough to have personally known Caravaggio or not, he was a critical advocate for the latter’s art throughout his long career in Naples, where Caravaggio’s style maintained a longer hold well into the middle of the century. Ribera’s early Sense of Taste (c. 1616; Wadsworth Atheneum) is a masterpiece of realism and an interesting counterpoint to Caravaggio’s Youthful Bacchus. Both invite us, by raising a glass, to indulge in the sensuality of good food and wine, a very early example of the very modern sensibility that the viewer completes or activates the work of art. The Zurburán and the early Velázquez attest to both the impact Caravaggio made on Spain and the strength of the selection here. The balance of the exhibition selection ranges from the magnificent to the superfluous. The lonely La Tour is represented by a core group of tenebrist pictures that attest to Caravaggio’s influence; we just don’t know how Georges de la Tour picked it up, as he may have remained in France his entire life. There is a strong group of paintings by Simon Vouet, who was much indebted to Caravaggio, working in Rome in the decade or so after the master’s death. 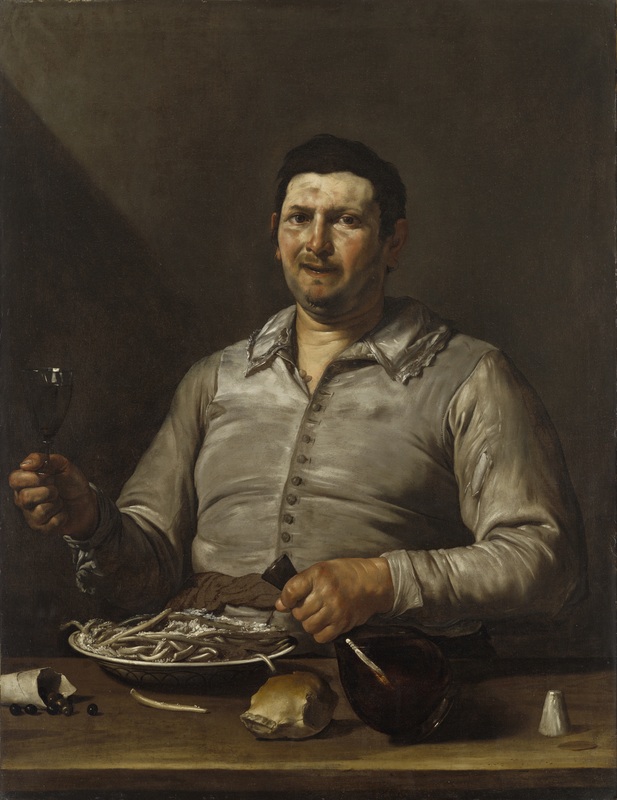 Especially notable is his presumed portrait of his brother Aubin (c. 1620; Musée Réattu, Arles), so vivacious it was once attributed to Caravaggio himself. However, the inclusion of pictures such as the anonymous French Herodias with the Head of the Baptist, the Lambert Jacobsz, or the Flemish St. Jerome is questionable. The present exhibition is a rite of passage for the Los Angeles County Museum of Art. It marks—as did the Los Angeles Opera’s recent production of Wagner’s complete Ring cycle—a coming of age, in this case of the greatest encyclopedic collection of art west of the Mississippi. While the exhibition is not without its shortcomings—organizing major international loan shows is no easy matter—it is a worthy endeavor. 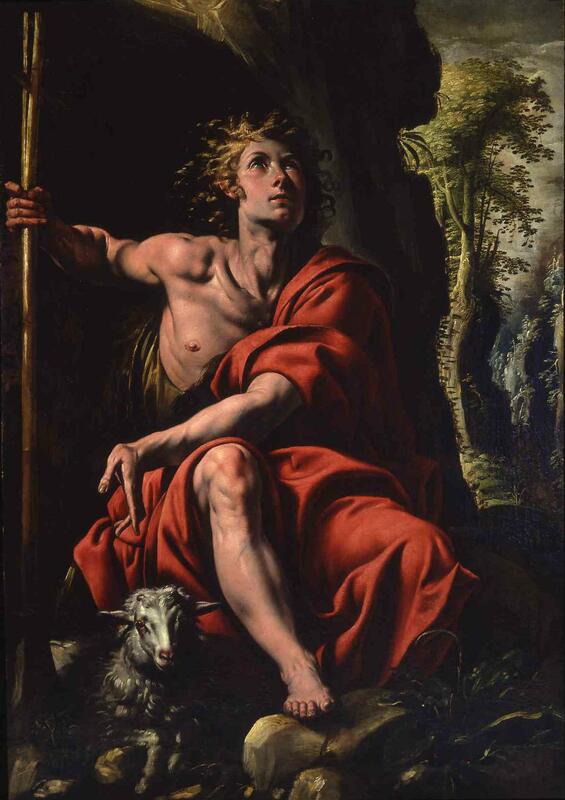 Also, astutely, the exhibition showcases the superb collection of Baroque paintings—Italian and otherwise, especially Caravaggesque—that LACMA has acquired over the past several decades, thanks to the excellent efforts of former curators Scott Schaefer and the late Philip Conisbee, and current curator Patrice Marandel. Bodies and Shadows: Caravaggio and his Legacy amply demonstrates, through its examination of the emphatic hold Caravaggio had on artists, collectors and the public, precisely why he is as relevant today as he was four hundred years ago. 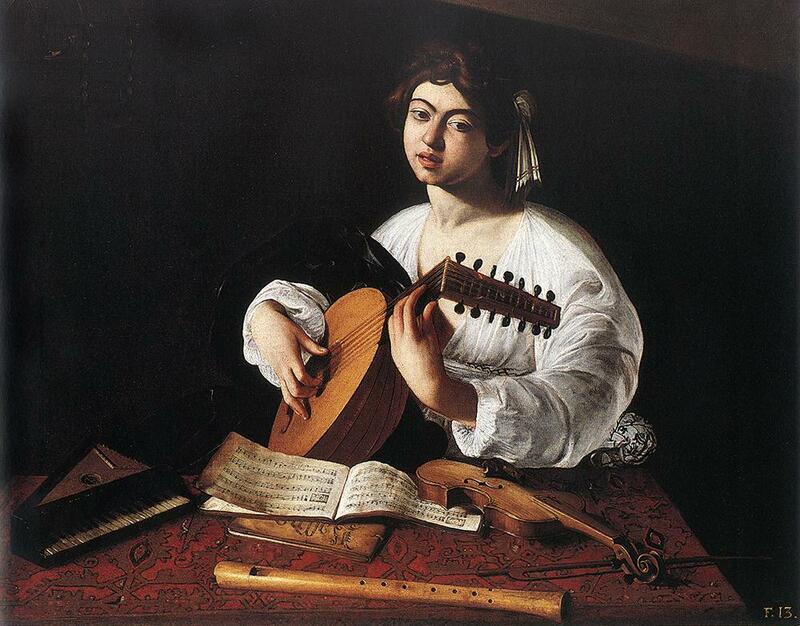 Caravaggio, and to some degree those who took up his cause, succinctly conveyed what was essential, what was real.